Multilingual Desktop Reader, converts to mp3. Trial version downloadable. Russian organization providing unusual variety of speech processing products and services for research and development, speech recognition, voice verification, speaker identification, noise reduction in speech signals, noise cancellation, forensic examination, audio analysis, logging and communication channel protection. Provides IVR systems and software with full support for open standard VoiceXML scripting. Enhancement options include various speech recognition and text-to-speech engines, call center integration, outbound dialing. Engages in research and development of speech technologies in a wide range of applications, including speech recognition (Whisper) and speech synthesis (Whistler) and Dr. Who. Bespoke speech solutions for the legal, media/broadcast, call centre and professional markets. Products include speech recognition, text to speech and a range of speech content analysis products including text and audio alignment, audio mining and speech detection. Market sectors, product information, and company profile. TAPI based interactive voice response (IVR) telephony software for voice modems or telephony cards. This software includes touch tone and speech recognition and text-to-speech generation. AppleÃƒÂ¯Ã‚Â¿Ã‚Â½s Speech Recognition and Speech Synthesis Technologies now give speech-savvy applications the power to carry out your voice commands, and even speak back to you in plain English, and now, Spanish. TMA Associates publishes Speech Recognition Update, an industry newsletter on the business, products, markets, and companies in speech recognition, text-to-speech, and speaker verification. The site contains headlines and recent news, as well as descriptions of TMA conferences and market studies in speech recognition. One of Indias global IT services and product-engineering companies, providing a wide range of speech-based IT solutions such as automatic speech recognition, text-to-speech synthesis, computer telephony, IVR, speaker verification and a version of IBM ViaVoice customized for an Indian accent. Unusual text-to-speech synthesis offerings including name pronunciation software for speech recognition dictionaries and other custom applications. Information, software, and support for developing applications, web or otherwise, that you talk with using speech recognition and speech synthesis from Chant Inc.
A global speech technology company, with speech recognition, text-to-speech, voice browsing, and VoiceXML solutions for telecommunication carriers and enterprises. Provides text-to-speech based speech output solutions for the automotive and mobile industries. Product and services information, technology overview, and news and events. Elan Speech, dedicated global provider of text-to-speech (TTS) technologies for telecommunications, multimedia, embedded systems and mobile solutions. Provides 2 ranges of speech synthesis technologies for high quality and low footprint requirements. Many languages and voices available for various platforms and operating systems. Text-to-speech for a wide selection of platforms - including servers, desktops and mobile. Provides a variety of languages, voices, and accents. Effective on line demo of speech quality. Speech recognition and VoiceXML specialists based in Australia. Development and hosting of natural language speech recognition and IVR applications and systems. Also EFTPOS and payment solutions. Provides Arabic and English speech enabled solutions for telecom operators and service providers, text to speech and speech recognition applications and solutions. Technology overview, news and press releases, and partner programs. 22 Speech Recognition Kit Sensory, Inc.
Sensory, Inc. provides low-cost speech recognition technologies for consumer products for the embedded speech recognition market and also offers a software solution for DSPs and microcontrollers. Provides custom built call center speech products including call routing and connect to live agent applications. Offices located in Europe and Australia, specialising in speech processing, digital data management and speech recognition algorithms development based on Microsoft technologies. Worldwide provider of speech recognition solutions for telephony, voice portals, automotive and consumer embedded systems, medical and legal dictation with multi-lingual capabilities. SDKs available for inclusion of speech recognition in business systems. Big Blues ViaVoice offerings in the desktop continuous speech dictation arena. Competes with Dragon Systems. Has mobile dictation and telephony products as well. Has continuous speech recognition for the Apple Macintosh. Speech Technology Magazine is recognized worldwide as the leading source of information on speech technology solutions that are changing communications and technology needs of organizations worldwide. Provides question-and-answer forums about Application Center, technical how-to information about deployment, maintenance, and support of Application Center, and troubleshooting and daily administration tips. By Microsoft Corporation. Desktop Web Reader based on MS-Speech API, coupled with speech recognition. Blog for Microsoft Speech Server, VBSalt, and speech application development. If the business hours of 2nd Speech Center in may vary on holidays like Valentine’s Day, Washington’s Birthday, St. Patrick’s Day, Easter, Easter eve and Mother’s day. We display standard opening hours and price ranges in our profile site. We recommend to check out 2ndspeechcenter.com for further information. 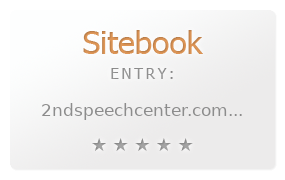 You can also search for Alternatives for 2ndspeechcenter.com on our Review Site Sitebook.org All trademarks are the property of their respective owners. If we should delete this entry, please send us a short E-Mail.